Pinkerton Tavern building still undecided. DERRY -- With all major land agreements out of the way, town officials say the widening of Route 28/Manchester Road could begin by August. Town officials are scheduled to close today on the Pinkerton Tavern property at 13 Manchester Road in a “friendly agreement” between the town and property owner Arnold Goldstein of Bedford, said Fowler. For $722,500, the town will acquire both the parcel and its existing building. Earlier negotiations had stalled after Goldstein pushed for an amount closer to a 2008 assessed value of $910,000. A more recent town appraisal of the property put the value at $700,000. Goldstein sought his own reappraisal, which came in at $745,000. 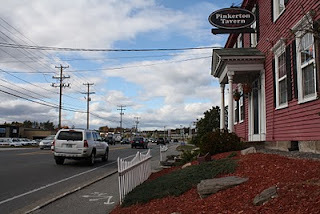 The owners of the Pinkerton Tavern restaurant were also paid $305,000 by the town to vacate the premises by March 15. Fowler said the town has secured agreements for pieces of 14 other properties within the widening zone, though there is some final paperwork to be completed. In total, the town will spend about $1.3 million on land acquisition associated with the widening, less than the anticipated $1.8 million, he said. Coupled with a favorable construction market, Fowler said, the project could end up more than a million dollars under budget. Originally, the town had planned on $6.5 million for the project to be covered by a fund balance and a bond of up to $5.8 million. Now, Fowler said, the total project will likely cost about $5.3 million. Walmart will pay about an 8 percent “fair share” portion of the project, which Fowler said now sits at about $424,000. The state is also expected to reimburse about $700,000 of the total costs, he said. Down the line, Fowler said, the goal is that TIF District revenues will cover the bond repayment. “Things have worked out favorably for the town and the general point is that we’re really close to getting a start,” he said. Fowler said he hopes to put construction out to bid in May and to begin relocating utilities shortly thereafter. The state will also still need to complete a final review of the project, he said. Actual construction work should begin by August, he said. The project will move in phases, he said, working on one side of the road at a time. At least two lanes of traffic will remain open throughout the project. Construction will continue until about Thanksgiving, he said, and then resume again in April 2012 for final overlay work. By July 2012, Fowler said, the entire project should be complete. But the future of the Pinkerton Tavern building that lies in the middle of the widening zone is less defined. Fowler said the town will likely send out requests for proposals to see if anyone is interested in purchasing the building as a whole or dismantled into pieces. In the worst-case scenario, he said, the building would be torn down. Fowler said he expects to begin soliciting proposals as early as next week.